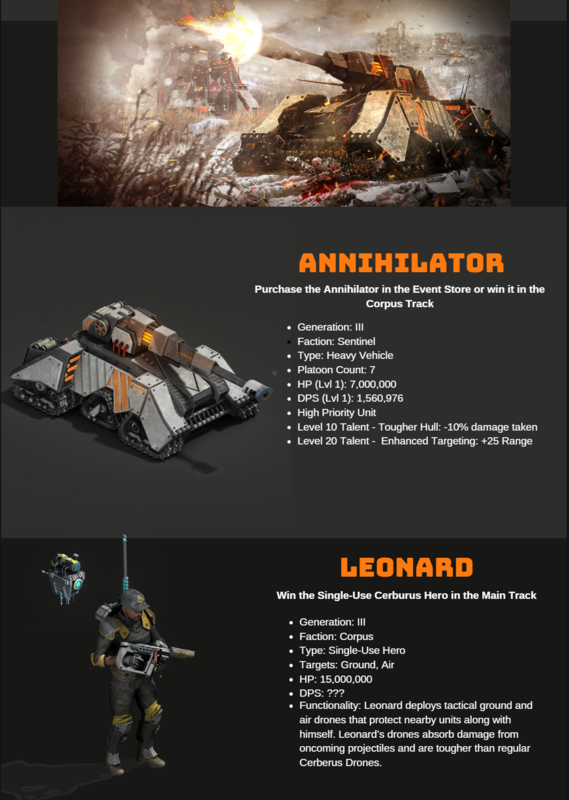 [UNIT SPOTLIGHT] Annihilator and Leonard! Check out the Annihilator and Leonard units this Thursday at the launch of Operation: Great Awakening! well i already expected cerberus hero nice job. How about Info on range and amount of build space needed. We are severely lacking storage for ground and air units. Leonard has a range of 360 and a platoon size of 375. The Annihilator has a range of 425 and a size of 550 before any reductions. Hope this helps! Plenty of space when you upgrade storage, hangar, & armory. Lyle, You sure Annhilator stats aren,t backwards.7 per plat is 425 size not range and range prob is 550 yes ?? I assume it targets ground and not air. This tank should peak the interest of your players Kix Good Job!! Purifiers didn't have much utility. Sadly. Now if players had access to the TB version. the ones that actually have a Piercing Shot ability, they would still be a useful gen 1 unit.